Krementz & Co., Newark, New Jersey. Last month I wrote about the double bean-and-post cufflinks created by Krementz & Co. in the years around 1900. Founded in the 1860s by the eponymous George Krementz, Krementz & Co. was a leader in the creation of fine cufflinks and other gentleman's accessories. In many ways the story of Krementz & Co. is the history of the American jewelry industry over the past 150 years. In no branch of skilled industry perhaps in the world, have more rapid advances been made than in the jewelers' art, and the industrial pursuits of a kindred nature. 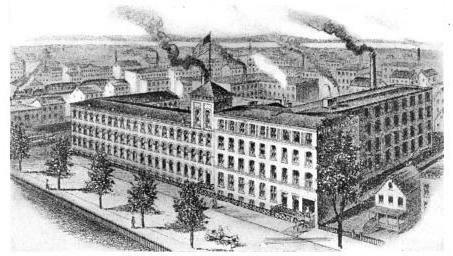 In former years, especially for the finer and more artistic productions in these lines, the American people were compelled to look to Europe for their jewelry supplies, but to-day Europeans look to America, to Newark, which manufactures fully seven-eighths of all the jewelry in the whole United States, and is noted for its beauty of designs, excellence of workmanship and highest standards. One of the more prominent concerns devoted to this important industry, which has done much toward placing Newark to the front as a manufacturer of jewelry and well worthy of more than passing mention is that of Krementz & Co., located at 49 Chestnut Street, with branch offices at 286 Fifth Avenue, New York City and 722 Shreve Building, San Francisco, Cal., was established in 1868 by George Krementz and Julius A. Lebkuecher, which partnership has continued to the present date and has developed into one of the largest and best known firms engaged in the manufacturing of fine 14 karat gold and platinum jewelry, the line being probably the most extensive and complete one of fine jewelry made under one roof. Ladies' jewelry — Brooch pins, veil pins, necklaces, lavalliers, bar and handy pins, bangles and bracelets, lorgnons, soutoirs, etc. Men's jewelry — Scarf pins, sleeve links, vest buttons, studs, chains, fobs, match boxes, tie clasps. Krementz & Co. are also the manufacturers of Krementz collar buttons, which enjoy a national reputation; in fact, are known the world over, and are made in 18 karat, 14 karat, and 10 karat gold and 14 karat rolled gold plate. One of the latest achievements of this concern is its new patented Bodkin fastener which it uses on mother-of-pearl vest buttons and studs for evening dress. While these mother-of-pearl dress sets for gentlemen are much in vogue now and finding a very ready sale, this new Bodkin attachment has given a very material impetus to the popularity of this line. The very newest of its creation is the making of the bean and post of a gentleman's cuff button of one single piece of metal. This feature has greatly increased the output of men's cuff buttons. The richness, strength, durability and beauty of style and finish of the jewelry which this establishment turns out, are marvelous. A firm and unalterable determination from the start to use nothing but the best and purest among materials, to employ artists of the highest order, and workmen of skill and character, it has built upon this foundation an industry of grandeur and promise. The illustration shown above of the Krementz building gives an idea of the large space and facilities required in the manufacture of the various products, while in the neighborhood of three hundred skilled workers are continuously employed to conduct this immense business. 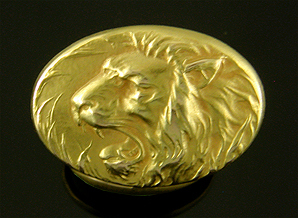 Krementz double leonine cufflink, circa 1900. Recent additions to the Antique Cufflink Gallery include figural Native American cufflinks by Krementz & Company, Art Deco radiant waves, a striking dress set with grayish blue Hawk's Eyes and an elegant Art Deco dress set with octagonal onyxes. The Song A Native American sings a song of joy or lament, perhaps it is both. These beautifully sculpted cufflinks were created by Krementz & Co. in 14kt gold, circa 1900. Hawk's Eye An elegant tuxedo set with Hawk's Eyes set in yellow gold. The blue color and chatoyancy of the Hawk's Eye plays beautifully against the warm tones of the yellow gold. Crafted in 14kt gold, circa 1950. In the Antique Stickpin Gallery recent additions include a fierce lion from Wordley, Allsopp & Bliss.